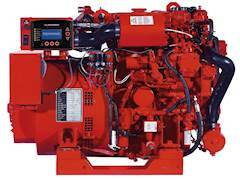 Important Note: This genset is for export only and for use outside of the United States and its Territories. It may not be sold back into the US and/or used in a vessel registered in the US. Consult your local authorities for specific regulations in your area. The wave of the future, Westerbeke D-NET™ electronic generators are offered with standard Westerlink or optional NMEA 2000® compliant databus communication. NMEA 2000® is a network for shipboard communications developed under National Marine Electronics Association (NMEA) standards. NMEA 2000® generators, combined with other certified components, allow boat builders and their customers to significantly reduce the cost, weight and space normally required to run cables throughout the vessel. All certified components freely communicate and are linked to just one NMEA 2000® cable using "T" connections that simplify networking. All Westerbeke D-NET™ generators have available digital controls offering simplified and easy to understand information on operational status and, if necessary, system diagnostics. Westerbeke also features "at a glance" illuminated lights indicating proper operation. They monitor battery voltage, generator voltage, generator frequency, oil pressure, coolant and exhaust temperature. All this information may be viewed from a distance-all green lights indicate referenced systems are functioning properly. Further details are available on the screen display. The user may conveniently scroll for operational or diagnostic information without encountering "codes". Westerbeke uses text so the user does not have to refer to a manual to dicipher numeric information. Operating at 1500 RPM with newly designed, tuned air intake silencer and 3-cylinder engine, the 9.2 EDT generator runs smooth and quiet. Augmenting this desired effect is the electronic governing that virtually eliminates "droop" when load is applied. Include the optional Sound Guard SST with high quality stainless steel base and frame with stylish powder coated aluminum panels and you have a generator as attractive as it is quiet.